Nuclear Scintigraphy or ‘bone scan’ as it is more commonly referred to, is a diagnostic imaging modality used to further aid the diagnosis of orthopaedic problems by indicating areas of increased bone activity. Alongside radiography and ultrasonography, it can be vital in identifying areas that may be contributing to lameness or poor performance. During the procedure, your horse will be injected with technetium 99m, 2 hours before being scanned. Technetium 99m is a radioactive substance taken up by the osteoblastic cells in bone. These cells are responsible for the laying down of new bone and their activity increases when the bone is subjected to stress. 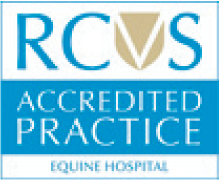 Your horse will then be sedated and taken into our scintigraphy unit where your horse will be scanned using a gamma camera. This gamma camera contains crystals that emit a signal when exposed the radiation and transmit the signal to a computer that picks up the isotope signal and correlates it into a 2D image, highlighting areas of increased radiopharmaceutical uptake. The information collected from the bone scan is then used to narrow down or pinpoint the area of lameness. Diagnostic analgesia (nerve blocks) and other imaging modalities are then used to assess the sites of increased radiopharmaceutical uptake. Any necessary treatment can then be carried out. Although bone scan is a safe procedure, in order to satisfy regulations, your horse will need to stay in the hospital until 4pm the day after scanning. This is to ensure the radioactive isotope has sufficiently decayed to minimise exposure to the public. Visiting is also prohibited before 4pm the following day. Please note that the processing and analysis of the images can take a significant period of time, therefore the results are usually not available until the morning after scanning, when your clinician will contact you and or the referring veterinary surgeon.